Libraries are full of resources that can show us other ways of being, living, making, doing. They are essential to our practice as impractical laborers. Please enjoy browsing the virtual stacks of the ILSSA Reference Library, an evolving index of readings & resources contributed by ILSSA members. In advance of each ILSSA Group Residency, participants are invited to share some of their favorite resources with the group. What tools do they find essential for living, working, making, being? An incredibly inspiring and useful gallery of early animations that play at real-time speed and then frame-by-frame to facilitate study. I LOVE this book (the subtitle of which is "Poetry and Assertive Force and Contradiction") and am essentially ALWAYS reading it. It is kind of like an artist's statement on steroids. Young writes "Poetry is not a discipline. It is a hunger, a revolt, a drive, a mash note, a fright, a tantrum, a grief, a hoax, a debacle, an application, an affect . . ." This little book just feeds me in a way that I can't really explain, but I think it is one that any "maker" should read. I was reminded this spring of this essay thinking about money and class in the context of activism—relevant also for collective artistic work, I reckon. It's from 1992, so some of the ideas may feel a little more central or obvious now than they did then. I continue to find it really helpful. There are two sidebars of note, one called Class Background Indicators, and one a cheat sheet on class background. The PDF is thanks to Bread Uprising, a cooperative bakery a while back in Durham, NC. Current practice shared with other members at the Group Residency. [His] poems [are gifts]. I also often read from this collection of essays, where he writes about craft and making, and he can be heard reading favorite poems here. Where artists (particularly Edward Steed currently) beautifully illustrate the absurdity of the modern world and remind me to find humor as we do our best to navigate it. I actually have a handwritten, signed copy of this hanging above the dresser in my bedroom. I read it EVERY day. Every morning I forget how it is. In great strides above the city. Then, I remember my shoes. I will look into the earth. This residency interested me partly because the call invoked Kathi Weeks & this text; here's the PDF. A year seems like a lot of time now at this end—it isn’t. It took me three years to reclaim my full flow. Don’t lose your sense of urgency on the one hand, on the other, don’t be too hard on yourself—or expect too much. Beware the terror of not producing. Beware the urge to justify your decision. Watch out for the kitchen sink and the plumbing and that painting that always needed being done. But remember the body needs to create too. Beware all that hatred you’ve stored up inside you, and the locks on your tender places. For me, at this time, every issue is a gift. Here is something that's brand new to me: her work and her shared teaching tools, such as this and this, and just the context they exist in for me / if you want to be overwhelmed with more. While the exhibition ILSSA Implement was installed in the VSW Gallery (Rochester, NY), the ILSSA Co-Operators selected the following titles to be stocked in the VSW bookstore as the ILSSA Influences exhibition, contextualized by the following note: "We think of our favorite books as tools for understanding other ways we can be in the world. Here are a few that have been influential in the founding of ILSSA, or have helped us chart course since then." Socially engaged art that engages non-art audiences, Oring's work continues to be an inspiration to us. Sheryl was also an artist involved with Booklyn, and as Local 917 Shop SO she is a current member of ILSSA. Against Competition, Marc Fisher, Temporary Services, 2014. An argument for art that is collaborative, participatory, and network-building. A Guidebook of Alternative Nows, Amber Hickey (ed. ), Journal of Aesthetics & Protest (JoAAP), 2012. ILSSA contributed (see p. 26!) to this anthology on art, labor, and economics. Booklyn Education Manual, Booklyn, 2015. Bridget and Emily (the ILSSA Co-Operators) contributed to the first version of this manual in the early 2000s. The Craftsman, Richard Sennett, Yale University Press, 2008. Craft: the desire to do a job well for its own sake, regardless of medium. The Elementary Forms of the Religious Life, Emile Durkheim, 1915. Collective effervescence. Bridget’s undergraduate degree was in Anthropology, and this foundation continues to inform ILSSA. Quotes from wide-ranging sources on working together: some food for thought. Art as public engagement, participatory performance, aesthetics. Bridget & Emily worked alongside Christine at Booklyn. The call-and-response as a participatory art project. A wonderful and heartening treatise on why make books, now. Revisited, reimagined, rewritten, & reprinted every few years. Aaron Cohick is a long-time ILSSA member, Local 719 Shop NLP. “Art should not provide answers, it should ask questions.” A fantastic reader on socially engaged art. Linking education to social change. Creating the world by transforming labor. Consciousness raising as tool. All aspects of publishing—not just bookmaking—as a creative practice. Why publish on paper, now? How do we build & sustain feminist organizations? “Be patient toward all that is unsolved in your heart and try to love the questions themselves.” Love and friendship as providing opportunity for solitude. Ritual practice and its study. Bridget’s undergraduate studies in Anthropology continue to inform ILSSA. A zine documenting an artist-made "speculative health wearable" "designed to counteract the effects of unfulfilling work." As ILSSA, one of our perennial questions is how can we build effective affective tools? The intersection of art, publishing, action, and the reactivation of everyday life. The sociology of work: foundational research for Surveying the State of the ILSSA Union. Emily began publishing zines in 1993, and zine culture is an important influence of ILSSA. Every time I watch, I get inspired. So many different ways of working and problem solving (and so many different problems to solve). So much to learn from others. Especially the epilogue. My other tools here are oldies but this one is a recent read, and the parts I like especially have to do with the relationship between labor & capital, and here it's so clear that not-for-profit, co-ops, small/local businesses, etc. are totally not exempt from market forces and it makes me want to make sure the community organizations I work in do their best to design their structure to avoid labor exploitation. Speaking of tool kits, and access, I turn to these libraries / tools to mine material / just see what's up. Fiction is very important to me—to how I understand the world, my concept of truth; it has to do with being a woman; and the idea of ecstatic truth; fiction = art making; it's the validation of feelings are facts (or the inspiration of)... and there is so much fun stuff in the dept of fiction writing, and here is just one, a short story. If you text "Resist" to 50409, it will prompt you to put in your name and address, and whatever message you write in there will be sent to your senators and congresspeople by fax. It's a quick way to be in direct touch with your reps and politically active when you don't have much time. This may not be for everyone but I am revisiting [it] to anchor me in these times. My favorite passage: "It is not easy to demand the most from ourselves—from our lives, from our work—to go beyond the encouraged mediocrity of our society. It is not about demanding the impossible, but a question of how acutely and fully we can feel in the doing. For once we know the extent of our capability of feeling that sense of satisfaction, fullness, completion, we can then observe which of the various life endeavors brings us closest to that fullness." This constant choosing and active construction of one's life is to me what impractical labor is all about. The bibliography below is compiled from members' submissions to the ILSSA Working Group Temporary Library at the first ILSSA Convergence (2013) and the ILSSA Reference Collection (2010). 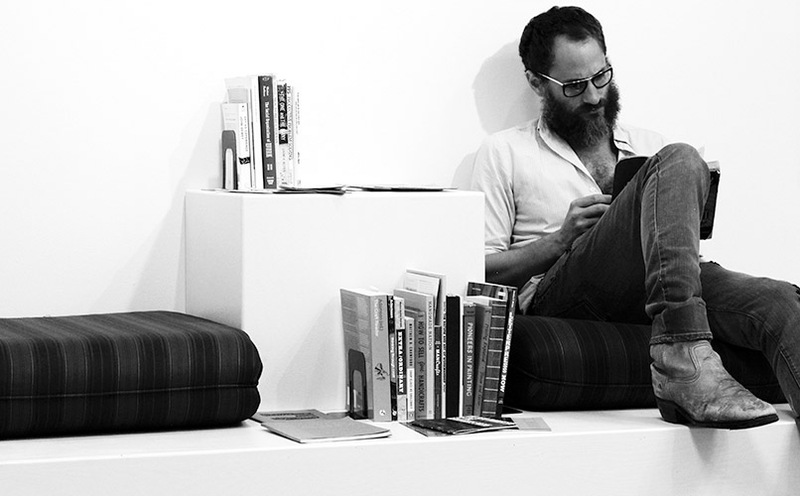 Local 917 Shop SE Chris Ruggiero reading the ILSSA Temporary Library installed at the Center for Craft, Creativity, & Design (2013).